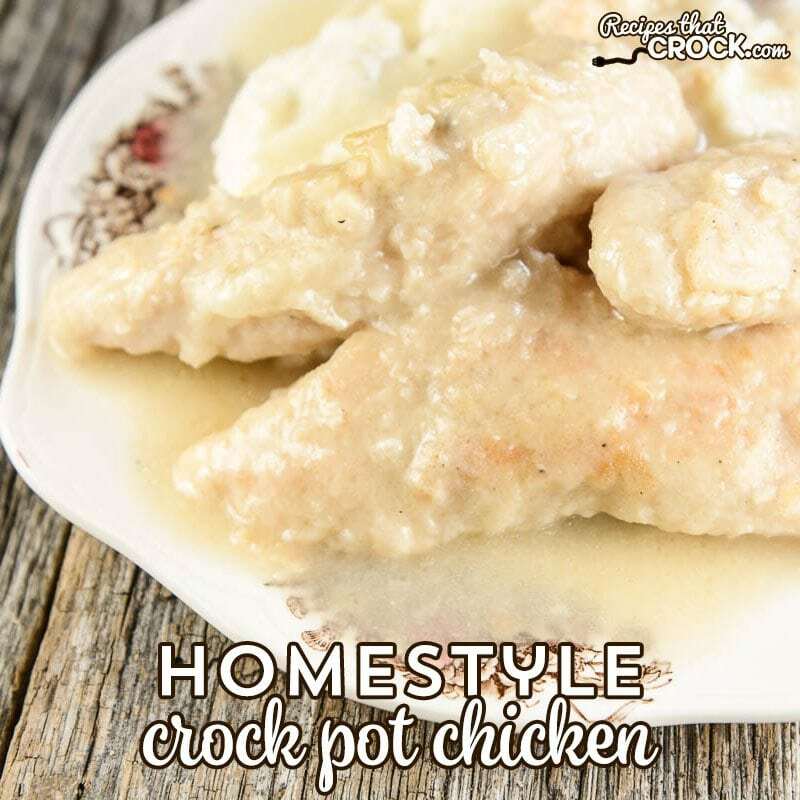 Homestyle Crock Pot Pork Chops - Recipes That Crock! Pork chops are one of my favorite meals. They bring back good memories from when Momma would make up pork chops and fried potatoes when I was little. Yum! Also now updated with a cooking show video from Mikey. 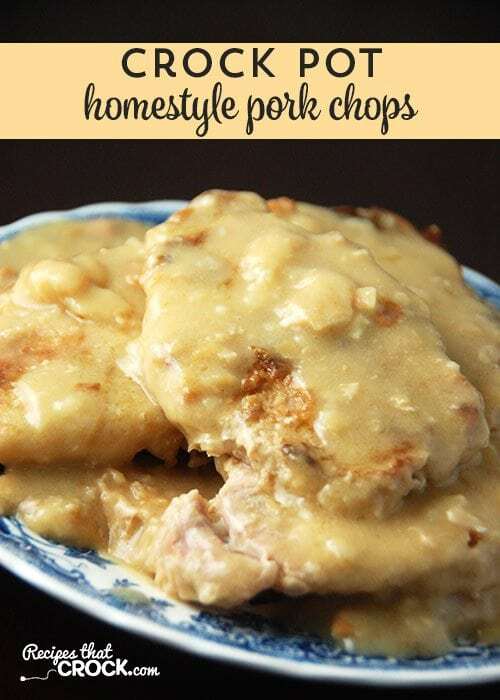 These Homestyle Crock Pot Pork Chops not only give you great flavor with minimal work, they have an awesome gravy that makes my mouth water just thinking about it! Another great thing about this recipe is that it is ready in a just a couple of hours. You can throw it together as soon as you come home, get some things done around the house and still sit down for a delicious dinner! I just love a recipe that takes very little work but tastes amazing! Don’t you?! These Homestyle Crock Pot Pork Chops were adapted from Gooseberry Patch’s Everyday Slow Cooker. Now… back to your regularly scheduled pork chops ;). We have a quick video to show you how easy this recipe is! Note: If the video isn’t loading properly, you can watch it here. 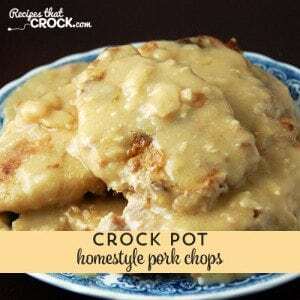 I made these yummy Homestyle Crock Pot Pork Chops in my Hamilton Beach Programmable Insulated Slow Cooker. Your favorite 5-6 quart slow cooker will work as well. I so want to make these! My mom is always complaining that pork chops are dry and I can tell these will be anything but dry. Is it okay to put these in those crock pot liners that you put in the pot? My dad was cleaning the inside of our crock pot once and I guess because it was heavy and slippery he dropped it and it broke. We had to buy a whole new crock pot because of it and have used the liners ever since. Will let you know when I make these how they come out. I love liners. We use them on just about any recipe, so go for it! Do you use the throw away liners or reusable liners? Cris has some reusable liners (referral link below) that are pretty awesome! Enjoy! Thank you so much for the link! I’ve never heard of reusable liners, we buy the kind in the store that come in a box of 3 or 4 which I think is a ripoff for people that use their crock pots a lot and you throw them away. Reusable is always better in my book! You are quite welcome! Cris LOVES her reusable liners! These were the best pork chops ever. Didn’t need a knife. I cook mine on low for 5 hours. I am making them again tonight. Thanks for the awesome recipe!!!!!!! I’m so glad you enjoyed these as much as we did! One of my favorite parts of doing this is hearing when someone loves a recipe I’ve shared! I just put these in the crockpot. They look so yummy. I added pepper, onion and potatoes and just doubled the chicken broth. That sounds delicious! I hope that you enjoyed them as much as we did! I’m making this for dinner tonight for the first time. I know they’re going to be good! You’re gonna love them! Enjoy! OMG…THEY WERE DELICIOUS!!!!! I had 4 very thick pork chops and my can of broth was 14.5 oz. and it was still awesome!!! Thank you, thank you, thank you! Looks yummy! Could you cook these on low instead of high? If so, how long would they take to cook? Sure! I would try cooking it for 4-5 hours on low. As always, make sure you are there to watch it the first time you try cooking it on low since I haven’t tried it on low. Enjoy! I haven’t tried it but would love to know if you do! Enjoy! Could I use bone in chops? Sure! You will probably have to cook them for a little longer, so make sure you can watch them the first time you make them to adjust the cooking time as needed!Enjoy!